﻿Welcome to the Home of the Panthers! Our school is taking part in the 2019 YRBS sponsored by the NHDOE and Health Services. The survey will ask about the health behaviors of 9th through 12th grade students. The survey will be done at school, is voluntary, and anonymous. A form explaining further should have been sent home (4/18). If you'd like to see the questions, click on the link below. Lisbon 7th grade, class of 2024, is selling spring bulbs to make your summer colorful and bright! Great bulbs at a great price! 50% of your purchase goes directly to the class of 2024 and will help us meet our $600 goal! armed services, graduation, and work force information. aged students 13-17 to attend. This is a sign-in & sign-out chem/tobacco/vape free event that is well supervised. The next Popcorn Friday is March 29th! Join PALS - Partners Assisting Lisbon Schools - see 'Parent' tab of this website for more information or join us on Facebook. Thank you PALS for giving each student a Panther Paw to show school spirit. PALS has more to sell for $3 each. Contact the office, Mrs. Woods, Mrs. Jesseman, or Mrs. Smith. The Parents Institute is education's #1 source of family involvement information. We encourage all parents to check out this monthly pamphlet for great information. 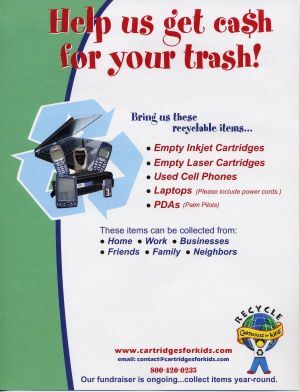 ​Send in used cartridges, cell phones, laptops, PDA's, to help raise money for the school. Abbey Group will be our new lunch services program this year. Please RSVP by April 8th! On Friday, 3/8, the elementary menu will be Macaroni and Cheese with Cornbread instead of grilled cheese and tomato soup. On Wednesday, 3/20, the middle/highschool menu has two entrees. It will only be ham and cheese calzones with marinara dipping sauce. On Friday, 3/22, the elementary menu will be grilled cheese and tomato soup. Students in grades 7-12 had an assembly on Thursday, September 20th about ALICE training and how to stay safe in an emergency. Below is the PowerPoint that was shared with them. Learn about the changes that have been made to the assessment procedures at Lisbon Regional School. Students in grades K-11 participate in Reading, Mathematics, and Language Arts MAP testing. The link below gives you information about the testing. First Day of School Photo Booth! Thanks, Susan Wall, for taking pictures!! Visit the LRS Facebook Page! The Facebook page is informational only and will have upcoming events and updated information throughout the year, including needed supplies for the start of school. The Lisbon Lions' Club is a big supporter of the Lisbon, Lyman, Landaff, and Bath communities. Visit their page to see upcoming events and activities. Alert Solutions is a notification system that allows us to keep in contact with your family through instant alerts. If you are not already in the system, please see the link below. All information relating to the LRS Assessment Procedures are on its own page under About LRS tab or follow this link. Powerschool Tutorials are now posted on the About LRS tab under Standards-Based Education or follow this link.